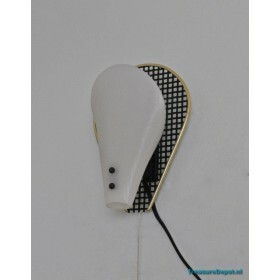 Cute wall lamp in the style of Mategot. Metal with a golden edge, plasic ribbed shade. 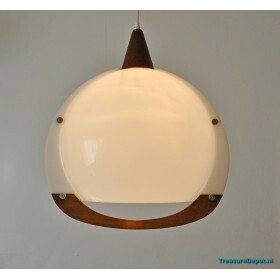 The height ..
Pendant from the sixties, probably made by Guzzini Italy. Made of acrylic and wood. 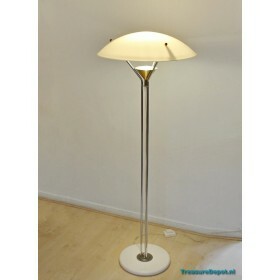 The height is ..
Floorlamp by Alta. The pole is chrome and gold coloured. The shade is plastic, colour creme and is.. Unusual hanging lamp designed by Uno Dahlen for Aneta, Sweden circa 1960. 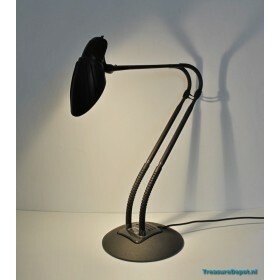 In green metal ..
Eighties desk lamp by Stephan Copeland for Arteluce Italy. Black plastic and anthracite metal. The..
Wall lamp designed by Anders Pehrson for Ateljé Lyktan Sweden. 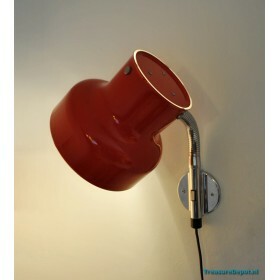 Red metal shade with chrome mou.. Elegant table lamp. 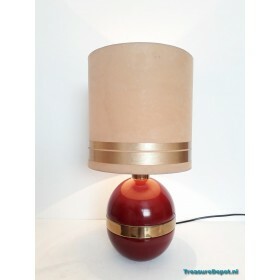 The base is made of metal burgundy lacquer with a copper ring. 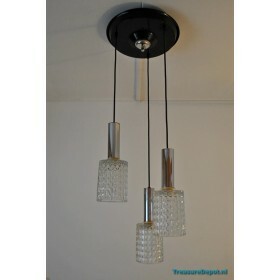 The shade is be..
Trio or cascade hanging light, made of glass and metal. The individual lights are 29cm and can.. Early sixties ceiling lamp. 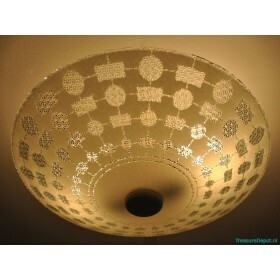 Glass shade 47cm in diameter. The height is 18cm. Condition is mint. 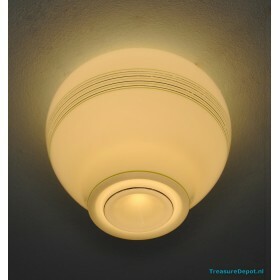 ..
Late fourties early fifties ceiling lamp. Glass creme coloured with green and gold stripes. 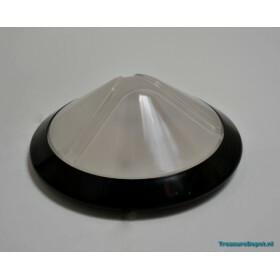 The la..
Large ceilinglamp made of glass. The height is 27cm and the diameter is 29cm. In mint condition. .. 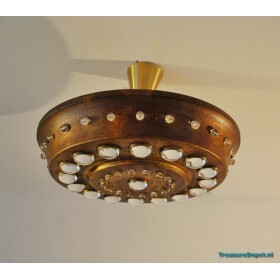 Unusual ceiling lamp, made of copper coloured metal and glass. 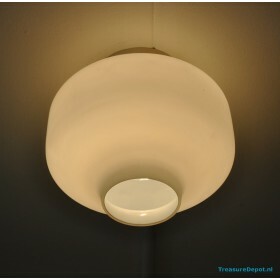 The diameter is 40cm and the height ..
Pulsa eighties ceiling lamp, made by Prisma Italy. Frosted glass with black plastic. The diameter .. 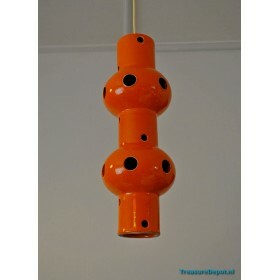 Ceramic hanging lamp from the sixties. Beautifull orange glaze. 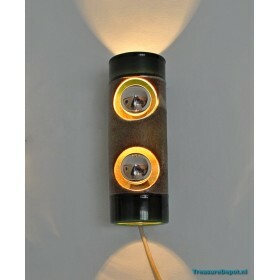 Probably this lamp is at it's best..
Seventies wall lamp, made of ceramic, green and brown. The height is 25cm, depth is 10cm and width ..